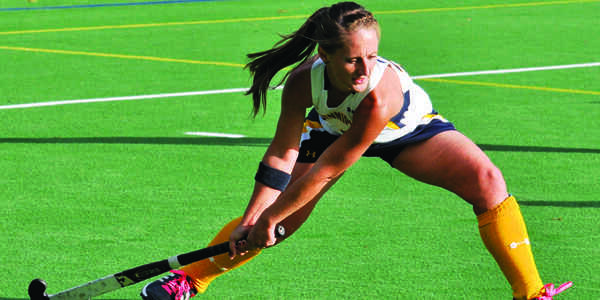 The Quinnipiac field hockey team fell to Monmouth, 1-0, in the Northeast Conference semifinals on Friday, marking the fourth straight year the Bobcats fell in the semifinals.Monmouth’s Patricia O’Dwyer scored the lone goal of the contest just under a minute into the second half and stood as the difference in the game. Nicole Lewis was the bright spot for the Bobcats as she made 16 saves in a losing effort and kept the game close. giving the team a great opportunity to win. The Bobcats were unable to take advantage of some key opportunities in the first half, as they outshot the Hawks 4-3 and held the advantage in penalty corners, 6-2. However, they remained scoreless at halftime. Monmouth opened the second half on O’Dwyer’s goal just over a minute into the half. 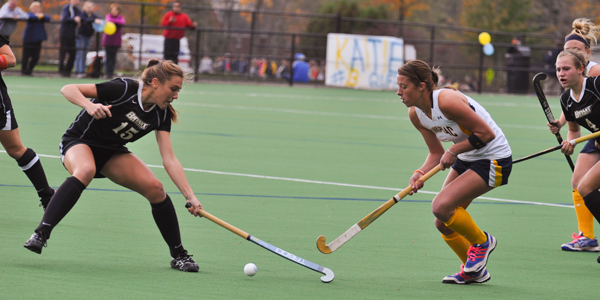 The Hawks continued to pressure Lewis, outshooting the Bobcats 13-8 in the final half and eventually winning, 1-0. The Bobcats had one of the most exciting seasons in recent memory, playing in eight one-goal games, including a memorable 3-2 win against rival Yale that was decided in a stroke-off, a game-winning goal off a corner opportunity conversion with no time remaining against Lehigh, and a last-second goal scored to beat Harvard. On Thursday at the NEC Awards Banquet held at Rider University, Quinnipiac’s Kaitlyn Notarianni was named to the All NEC Second Team. 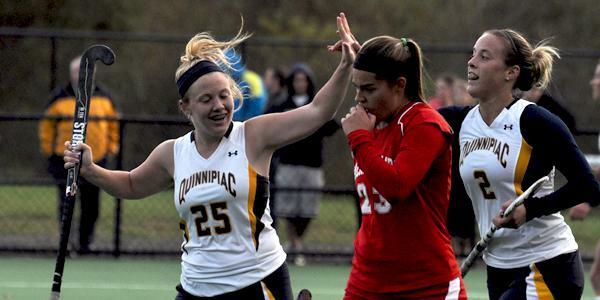 Megan McCreedy and Kim Cunniff were both named to the All NEC First Team. Kim Cunniff received the biggest honor for the Bobcats as she was named the NEC Defensive Player of the Year.